Matthew Mattingly: Perspective hacks III: Bleep the Veeps! 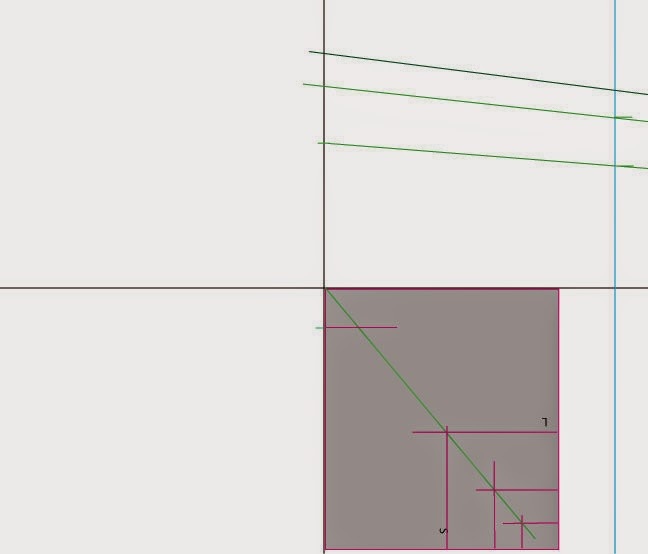 In the first Perspective Hacks we looked at the diagonal vanishing point, and how to replace it with a proportional estimate and an internally generated grid. In the second, we explored the "folded vanishing point" technique in which the remote VP is relocated to the page and used to generate related orthogonals. In this installment, we will learn how to set up a "two point" perspective drawing with no points at all. Imagine that you are stuck overnight in a desolate airport, with nothing to amuse yourself but a sketchbook, a pencil, and some scratch paper. You decide to create an elaborate perspective drawing from imagination. Or perhaps you are sketching a bucolic scene, but in the middle distance is Salisbury Cathedral or similar complex structure. You wish you could use perspective to help construct it, but you have no drawing board or thumbtacks. As with the other exercises, we start with a single orthogonal. This can be based on measurements, observation, or pictorial considerations, but will provide the basis for all related lines following. Here we see the horizon line, central vertical line, and initial orthogonal. 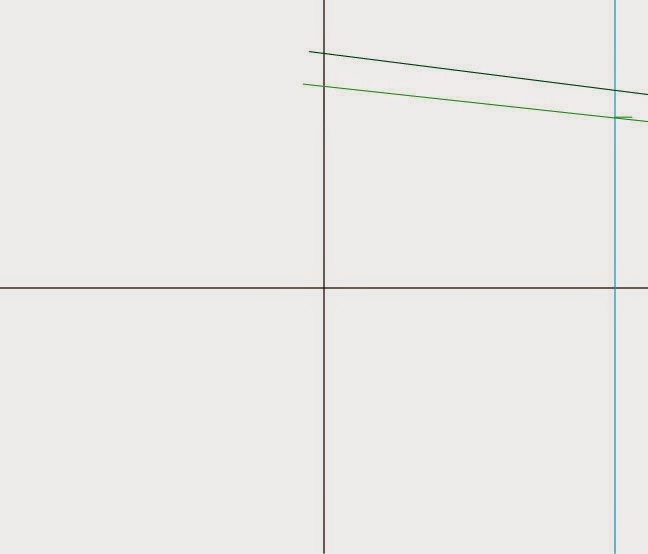 We are assuming this slanted line stands for a line parallel to the ground plane and rotated on its vertical axis so it appears to recede towards the horizon. We could use the edge of the paper as a reference, but here we are using a guideline, which can make it easier to make accurate measurements or simplify proportions. Here's were the scratch paper comes in. It can be practically anything - a post-it note, a sheet of notebook paper, etc. The subscription cards that come with magazines work nicely, as they are printed on heavier card stock. We are going to use this as a "ruler" to find the proportional relationship between the orthogonal and the horizon line. First label one side of your ruler "L" for Long. It's important to keep track of which side is which. 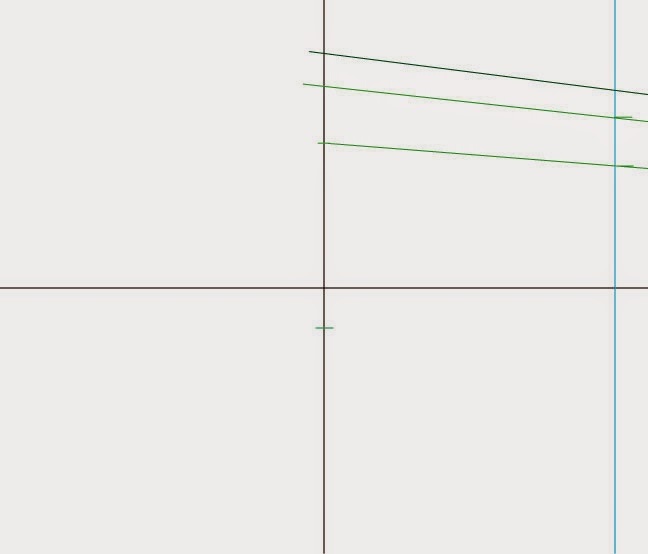 Line the ruler up with the horizon and center lines and mark it with a horizontal line at the intersection with the orthogonal. The horizontal should extend a little way across the ruler. 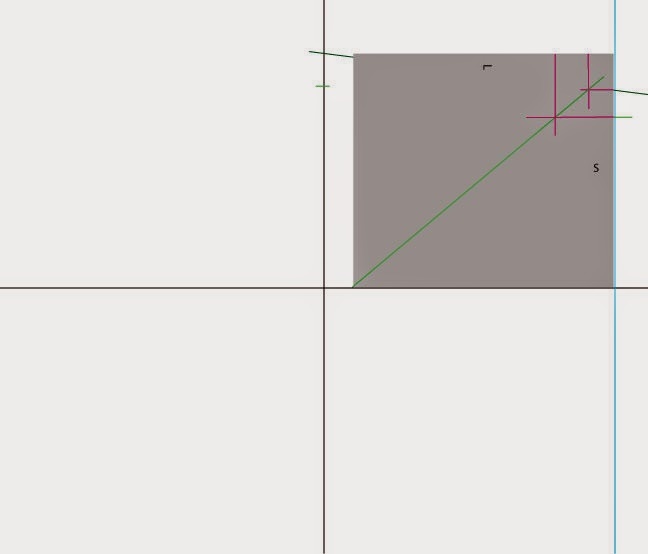 Now, rotate the ruler 90˚ so that the edge that was the top lines up with the guideline and the horizon line. Label this edge "S" for "Short." 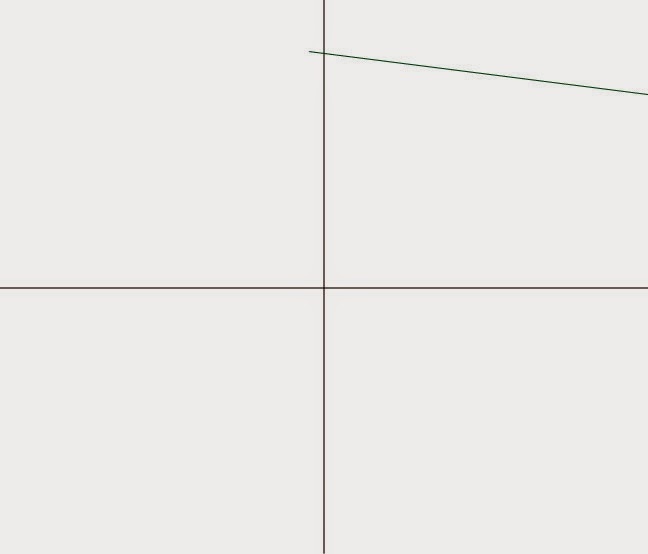 Mark the intersection with the orthogonal with a horizontal line intersecting the L mark. 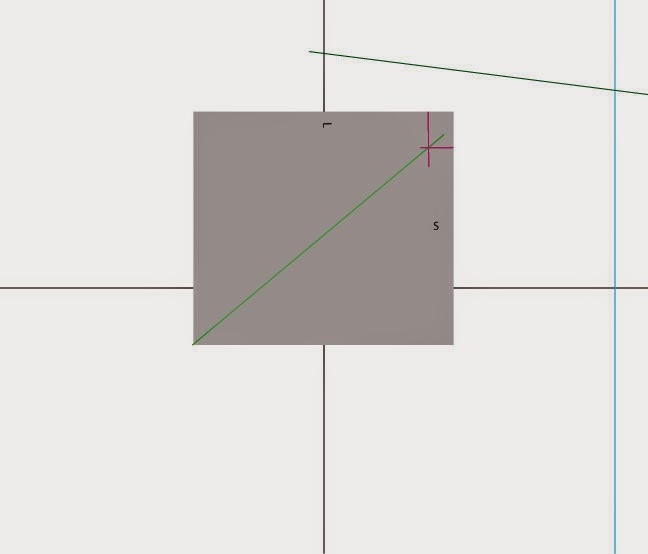 Draw a diagonal from the opposite corner through the intersection of the two marks. 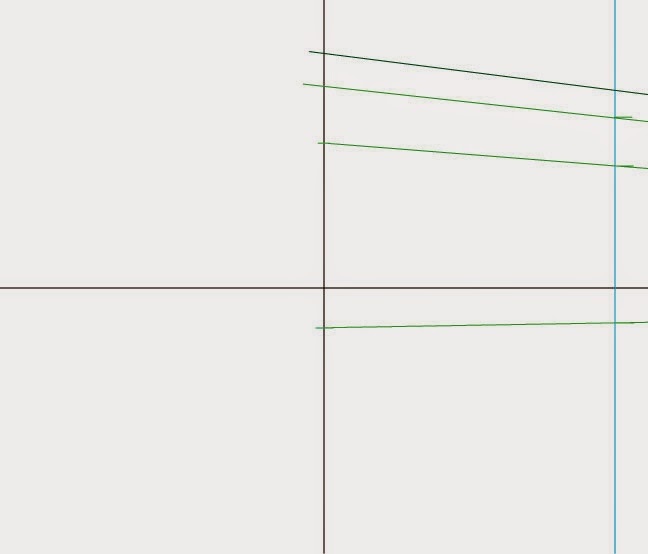 The slope of this line embodies the proportional relationship of every orthogonal parallel with the first to the horizon. 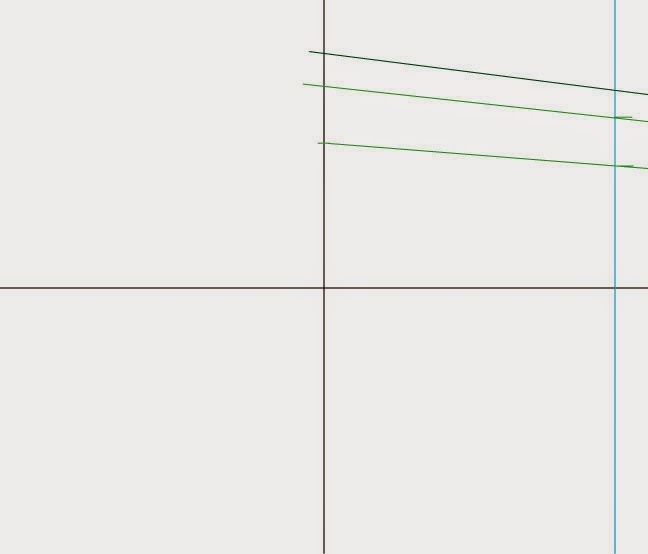 To create a new orthogonal parallel to the first and appearing to recede to the same vanishing point, start with a line on the center vertical where you want it to start. 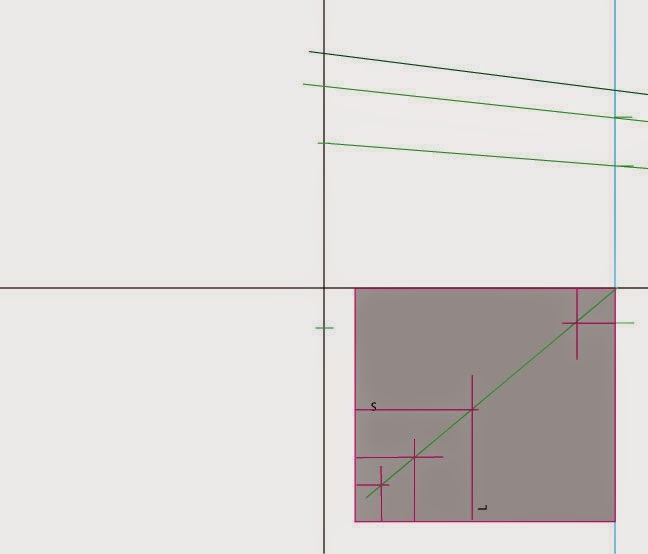 Line up the Long side of the Ruler as before, and draw a horizontal line at the location of the mark you just made so as to intersect with the diagonal. Rotate 90˚ and line up with the horizon and guideline. Draw a horizontal line from the intersection of the diagonal with the line you just made out to the edge of the Ruler. Mark the guideline at this point. Draw a line through the the two marks to the edge of the page. 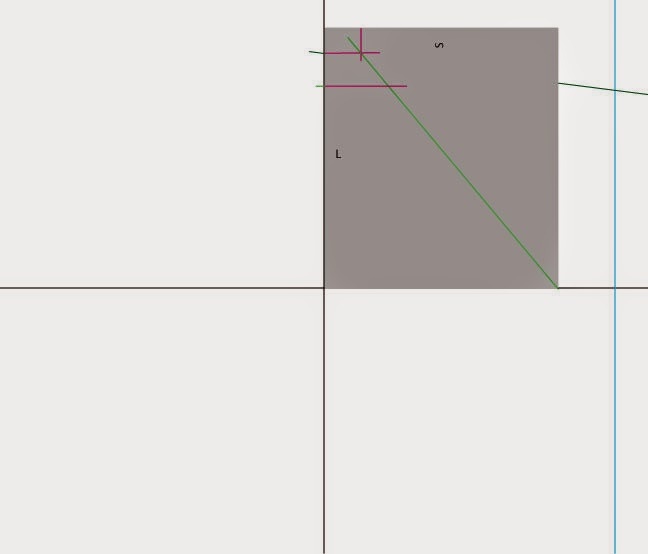 This is your second orthogonal. Here's the third, constructed the same way. For the fourth, we start under the horizon line. 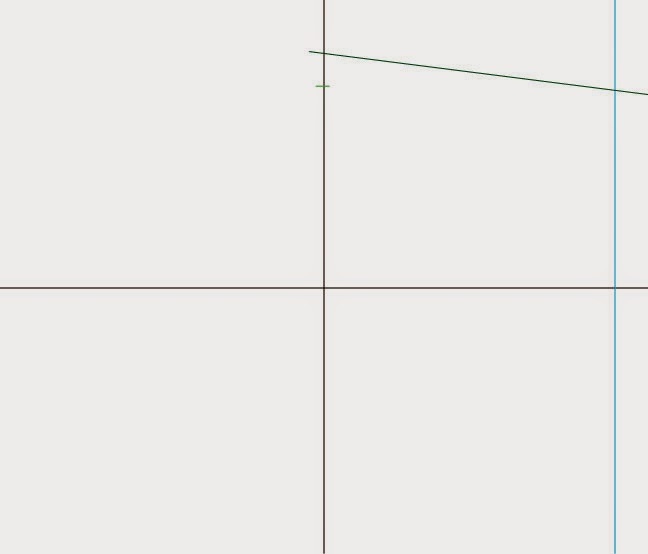 Turn the ruler upside-down and make a horizontal line intersecting the diagonal. Here, we used the opposite side to make the mark. There are several ways you could accomplish the same thing, depending on the size and shape of your Ruler. Rotate ruler so that what was the top is lined up with the Guideline. 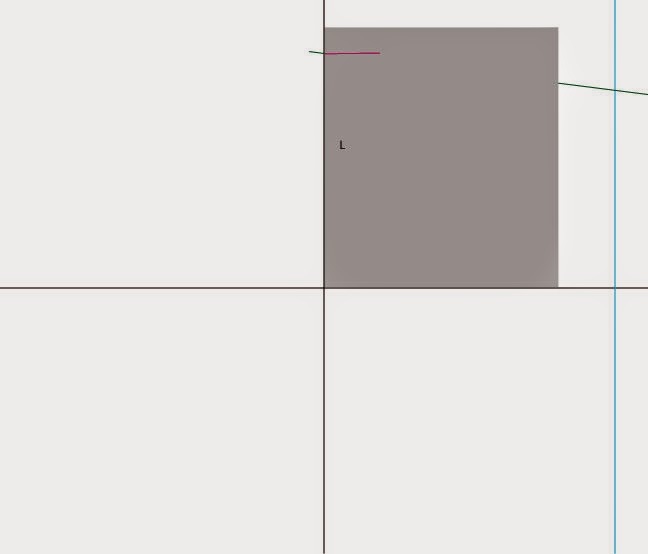 Draw a horizontal line through the intersection with the diagonal and mark the guideline as before. Draw a line through the two points. This is another orthogonal parallel to the others, but originating below the horizon line and pointing up the same implied vanishing point.